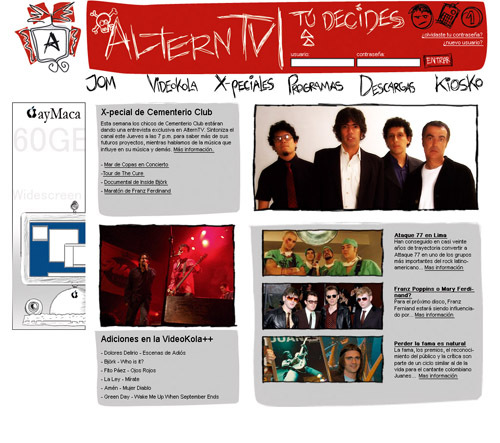 This image is the mockup for the website for Altern TV, a Peruvian-based music channel. I worked for two months on the idea of creating the music channel and researching the market in Peru. Altern TV is the music channel for the people, where viewers choose what they want to see. The channel would feature music out of this world, also emphasizing Peruvian Rock and music specials with interviews, news and the lastest. The slogan for Altern TV is “Tu Eliges“, which is Spanish for “You Choose”, and it’s visual style is based on a very raw, relax, punkish kinda look, where the predominant colors are red, white and gray scale colors. The website would be basic, giving the chance to vieweres to look at videos online, as well as get exclusive merchandise from the channel and other artists. The language of the site would be of common slang and some invented words like Videokola, which is a combination of the word Video plus the word Jukebox in Spanish, which is “Rockola“. After showcasing music, Altern TV’s primarly objective is to promote national rock bands. In the case that Altern TV expands, things like Award Shows could be developed, which will be given to extraordinary national talents, not only in the rock music field, but also in more traditional rhythms like Musica Criolla.